Concession (contested by the Ndebele). 30 Oct 1888 Region named "Zambesia" by the British. Salisbury and claims Mashonaland for Britain. 4 Jul 1964 - 12 Dec 1979 Zimbabwe war of liberation (Rhodesian Bush War). 24 Oct 1964 Renamed Rhodesia (not recognized by U.K.). U.K. as Rhodesia (not recognized by U.K.). 2 Mar 1970 Rhodesia becomes a republic. 1 Jun 1979 Zimbabwe Rhodesia (interim state). (Zimbabwe Rhodesia is in local official use). 18 Apr 1980 Independence from Britain (Zimbabwe). Rhodesia¹ (not recognized by U.K.). 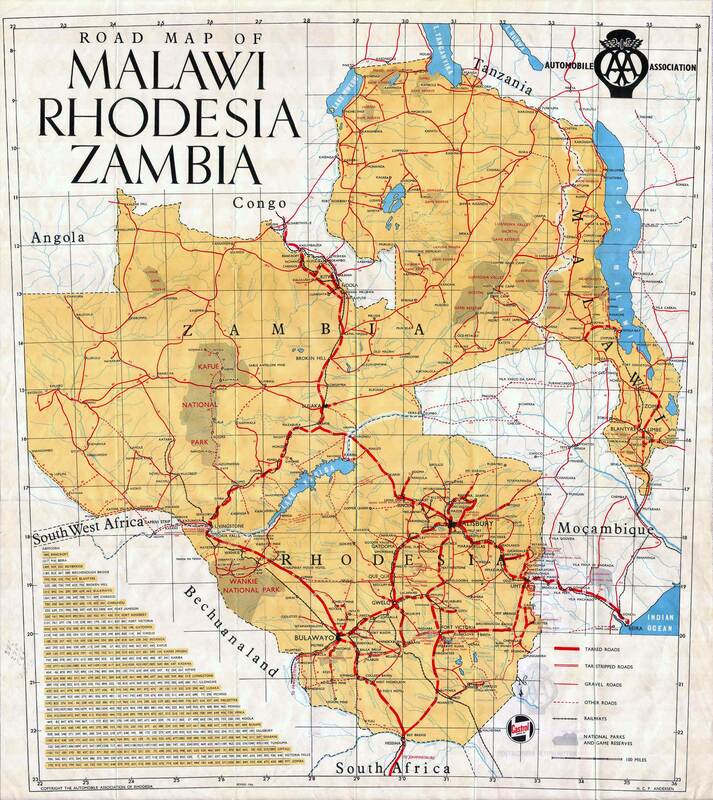 Rhodesia (Zimbabwe Rhodesia is in local official use). ¹The Officer Administering the Government was designated by the Constitution of Rhodesia of 1965 as representative of Queen Elizabeth II in her capacity as Queen of Rhodesia. Elizabeth II did not accept the legality of the existence of Rhodesia as a polity, and no specific local style was adopted for the monarch. 18 Apr 1980 Independence from U.K. (Zimbabwe). Territorial Disputes: Namibia has supported, and in 2004 Zimbabwe dropped objections to, plans between Botswana and Zambia to build a bridge over the Zambezi River, thereby de facto recognizing a short, but not clearly delimited, Botswana-Zambia boundary in the river; South Africa has placed military units to assist police operations along the border of Lesotho, Zimbabwe, and Mozambique to control smuggling, poaching, and illegal migration. also called the Central African Federation). 31 Dec 1963 The Federation of Rhodesia and Nyasaland dissolved.